We will introduce you to the wish list. You can now add wishes, vote for them, and ask the other parent to vote for or against the wishes and add comments. For example, your son needs new soccer shoes and you want to know if the other parent agrees to share this expense before buying them. 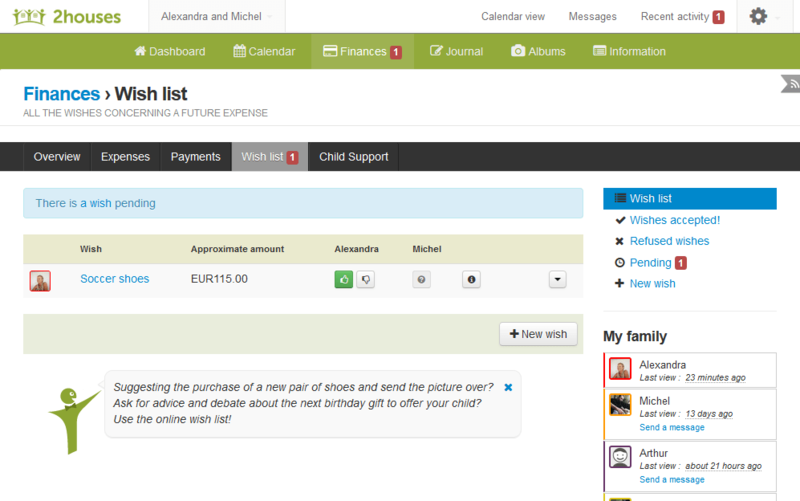 1) First, click on “Finance” in the upper menu, then “Wish list” and finally, “Add a first wish”. 2) You are now on the page on which you have to add information about this wish. Choose a category. If you haven’t created one yet, click on “Add a category” and fill in the fields (If you already have one or more expense categories, go to step 3.). 3) Next, add an amount for this wish, a title, and, if you want, you can add a description. You have the option to add files to your wish such as a text, a drawing, a picture, anything you want. To do so, click on “Select” or drop a file. Now that you’ve added the required information, click on “Save”. 4) And that’s it! After clicking on “Save”, the other parent will receive a notification and will be able to vote for or against the wish and/or comment on it. You’ll find your child’s wish in the wish list. You can also vote for it, add comments, and see the other parent’s vote. You have now added a wish to the wish list. Easy isn’t it?